Central World Shopping Mall has reopened. A taxi driver told me about its reopening earlier this week when we were stuck in traffic but it took seeing the bright lights and the milling human traffic from the BTS this evening for the news to sink in. While I applaud the spirit it took to drive a quick reopening since it was burnt badly in the protests this spring, I worry about the consequences of a badly damaged building being patched up too quickly to address safety standards. Personally, I’m not a fan of Central World. The restaurants there are not particularly good. The stores are all too pricey. The layout is confusing. The only feature I enjoy is the cinema, which I rarely go to since I watch most of my movies on planes. 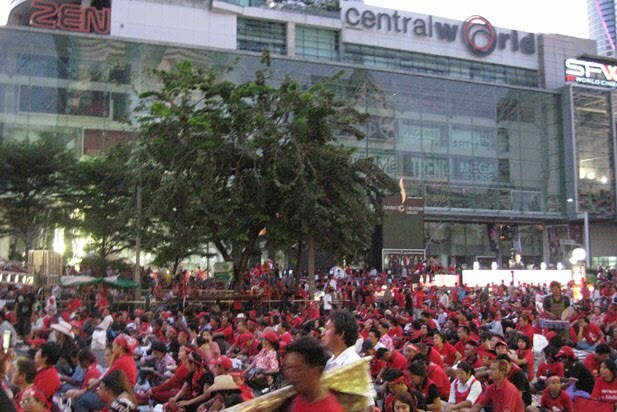 So when Central World was forced to close in April, I wasn’t particularly bothered or affected. 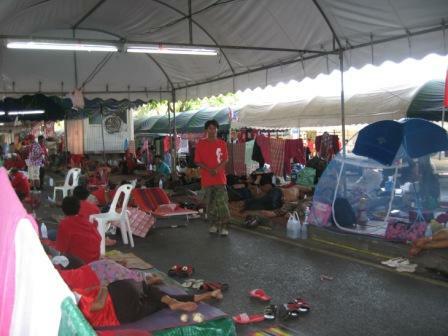 Many Bangkokians were, on the other hand. Central World was one of the many shopping malls locals like to frequent. 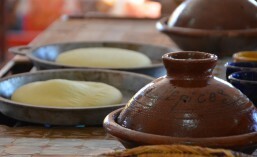 Centrally located, it was convenient, a getaway from the heat, and a place to socialise. To have it shut down and later torched was a horror and embarrassment for many locals. By being the “victim,” the site then became a symbol. Making the symbolism of its partial reopening even more important. The Western part of my thinking still worries about the stubbornly quick rebuilding. Considering that structural integrity and safety standards in Thailand are already questionable to my admittedly censorious self, I would rather see the building razed and started from scratch. Take a look at the videos of the fire and its aftermath, pulled from various YouTube sources. I do understand the desire to bring things back to normal as soon as possible. Americans stubbornly insisted that we will not be bent or changed as the result of the terrorist attacks. As humans, proud ones at it too, we want to put the bad past us as quickly as possible. The blackened remains of Central World that laid bare for all to see for a rather long while was a painful eyesore that served as a constant reminder of the protests. I just hope we remember to resume “normality” smartly, rather than just superficially. I have no bones about making you jealous. Of many of my social circle, I can- and do- brag having the best view from my apartment. So I see gorgeous sunsets pretty much daily, the rainy season yielding more dramatic colors with clouds. And most recently, where the fires are. Greetings. I realise I’ve been quiet as of late. I decided not to blog about the protests but as they got serious it got rather hard to be flippant about the events going on around me. Friends were evacuated out of the hot zone, checkpoints and army officers started showing up in my end of town, the Skytrain stopped running, and smoke coming out of the horizon started to be a regular occurrence. I wanted to talk about that but it would be nearly impossible to blog about it without giving those of you outside Bangkok an alarmist perception. My biggest problem was cabin fever. The Skytrain stopped operating as the protests started getting violent. Violent as in spurts of gunfire here and there, mostly as the military and police really tightened their surrounding of the protest area. The shooting, probably assassination really, of Seh Daeng, a renegade active duty army general turned protester was what set off the real tension. 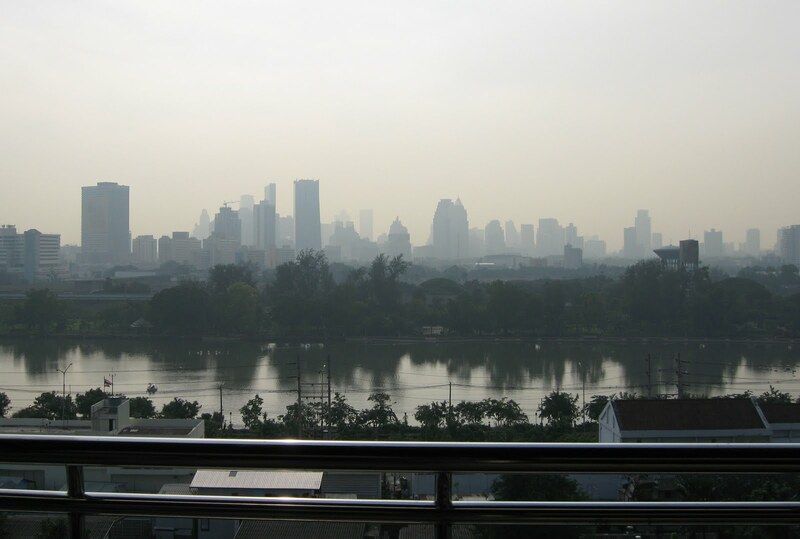 The eventual rioting and fires pretty much froze Southeast Asia’s second biggest bustling metropolitan area. I bought a bike. I loved it. With most people afraid to leave their homes or unable to cross from one side of the city to the other, the streets were lighter in traffic. I whizzed about my part of town easily. Sukhumvit was a hairy ride no matter the circumstance. But the sois and backsois are quiet, allowing for a easy cruise. Drivers tend to slow down on the smaller streets so I had more room to maneuver and react. Checkpoints gave me quizzical looks but never stopped me. Who else but a farang would be breezing by in an expensive mountain bike at these tense times? I should have gotten a bike earlier. 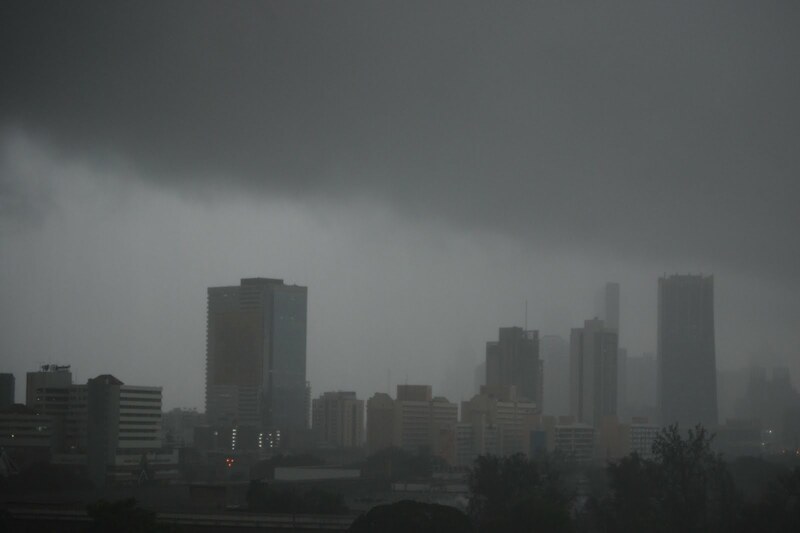 Did I ever mention what a gorgeous skyline view I have from my apartment? Due to my proximity to the convention center and park, I have an unobstructed, albeit distant, view of the city skyline. As a result, once the tire-burning started, I was able to see the smoke come up. Literally, I was watching the city go up in flames. I was able to tell really quickly where the last spurt of anger was. Anger management issues. What’s how a friend described the protester reactions following the shooting of Seh Daeng. As time passed, it became less and less clear what the protesters’ end goal was. In a way, I suspect they don’t know themselves. The prime minister offered a reconciliation plan, a truce, that pretty much gave them everything they wanted except for the timing. Instead of immediately, it would be in September. They couldn’t agree to the truce. Then as the burning and the shooting and eventually the fires started up, it seemed like the protest moment, even before the army rolled it, was falling apart. Some protesters claimed they were peaceful. Others were acting out against even their own, not allowing their injured a safe passage to medical treatment. I blissfully missed the rioting. Most of us were under lockdown in our homes and hotels. Some people called it a staycation to keep the spirits up. Boredom was a frequent companion though. Parts of our neighborhood lost power, although, luckily for only several hours. 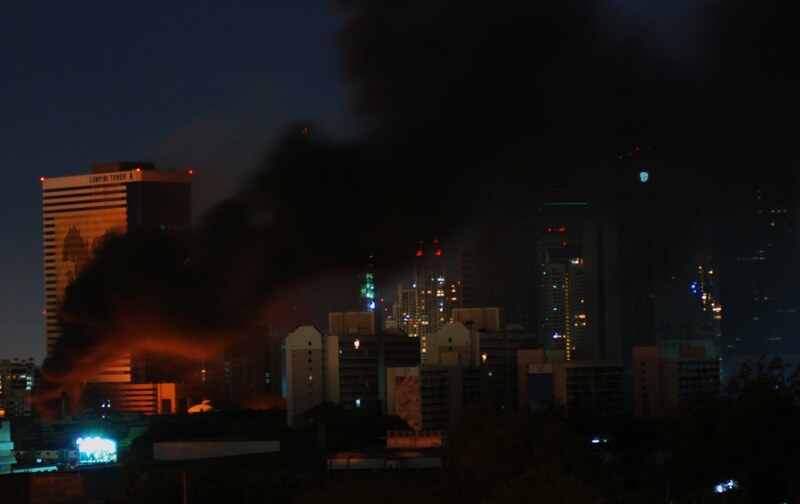 The fires set in Central World is particularly upsetting to the local community, though. To set a fire that damaging and that big, they must have gone inside. On top of that, thousands of livelihoods and jobs were lost in those flames. 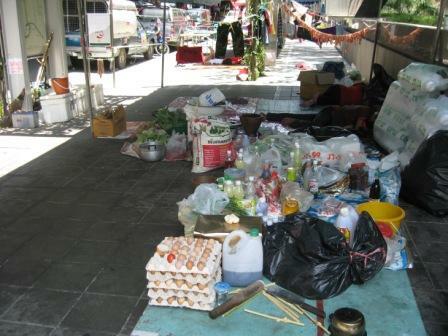 Its loss made the residents really understand how key it was to the local economy. 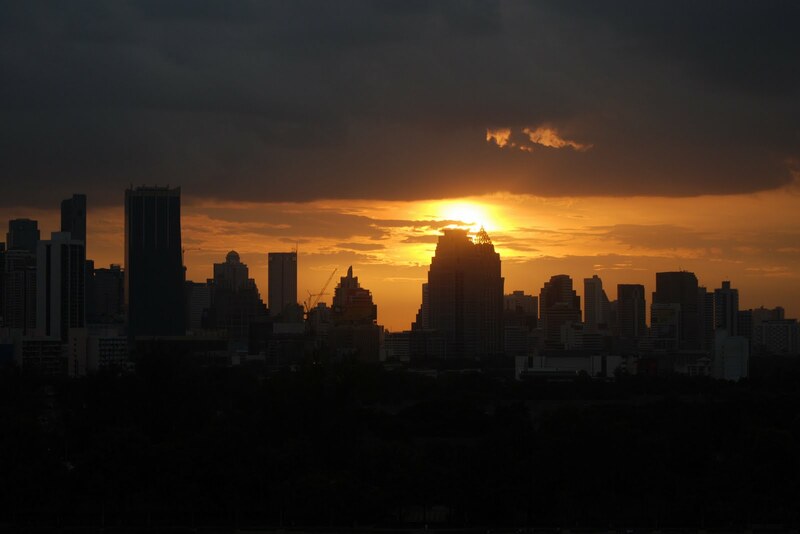 More than anything, the symbolic loss of what Bangkok is known for- retail mecca and modernity- was a huge blow to the core. 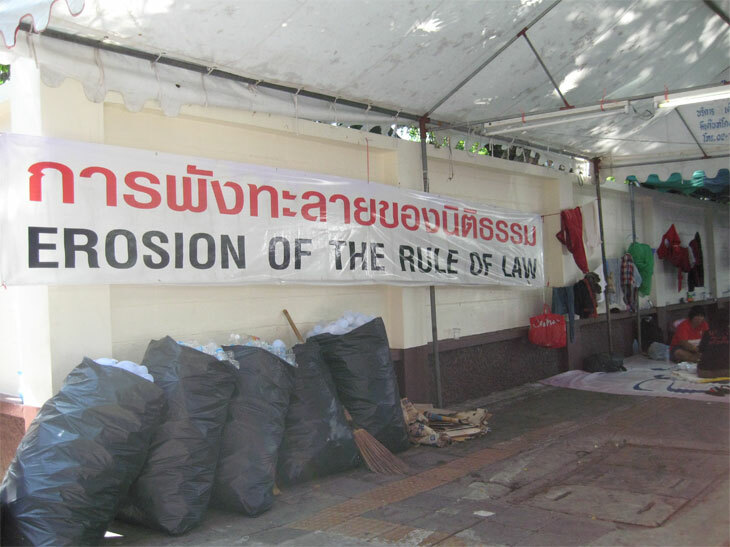 Perhaps in the Thais’ best show of grace and determination, when we expats frequently complain about lack of efficiency, the community showed up in great numbers for the clean-up. 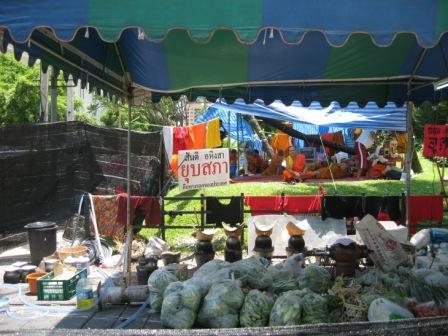 The locals are determined to bury the protests in the past and recover as quickly as they can. In some ways, it is admirable. 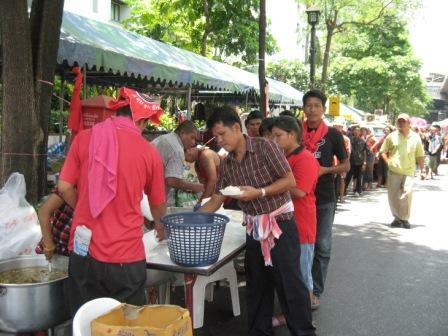 The sense of community and selflessness is not as frequently displayed in normal Bangkok life. In some ways, it’s denial. The protests highlighted issues with the intense class divide and to not address them simply defers another flare up. Life is resuming normality in Bangkok although the grievances of the protesters are presenting themselves in the other provinces, especially in the north where they are a stronghold. In the city, though, traffic jams have resumed, shopping coming back in full force. Retail will report profits this month. With the exception of fire-scarred buildings, it was almost as if nothing ever happened in this city, let alone a three month protest. It’s great the things are back to normal. But it was a significant population showing itself in the protests. Numbers like that don’t just disappear to the woodwork forever. If the House is any indication, Thailand needs to come to terms with their population’s needs. Whether it happens now or later is anyone’s guess. flawlessly, to the point of almost perfecting the tonal nuances enough for people to think I’m Thai. In all seriousnes, I do not make light of the events going on in Bangkok. There’s little I can say that you won’t already read in the news. 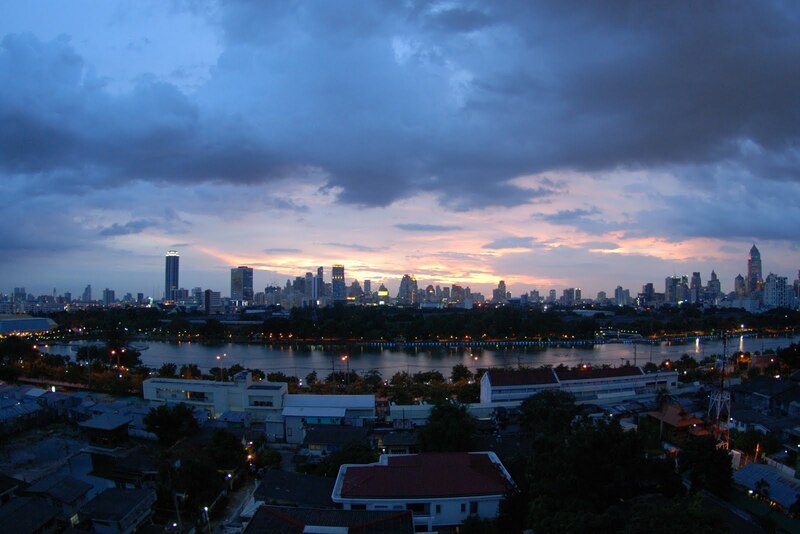 Like many Bangkok residents, I, we, are attempting to maintain some semblance of routine life, only in areas away from the protest and conflict activities. It’s easy to get sucked into the sense of frustration but I find maintaining a sense of humor, a healthy Thai dosage of mai pen rai, and resisting the urge to judge is crucial to remain calm and objective as a non-participant. As I am no professional reporter or international affairs analyst, there’s little I can contribute on this blog about the events surrounding me. I offer instead to continue catching up sharing observations, experiences from my time in this region. ..within a city is apparently easy as long as you have the numbers. The red shirts are digging in, stubbornly. Interestingly, monks are set up behind it. 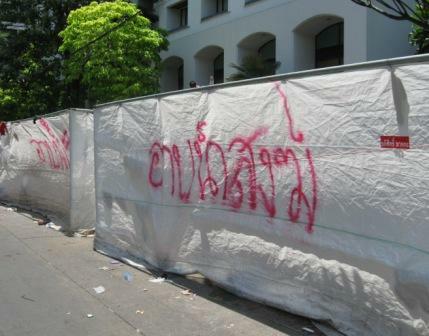 As much as I want to say “I told you so” because I had been the contrarian of my group, convinced that the protesters would not disperse during the Songkran holiday, but build up instead. I predicted they would remain and grow over last week while many suspected the government would attempt to clean house by the holiday. Both predictions turned out to be partially correct. Instead of earning bragging rights for my astute gauge of the Thai mentality, I now have a growing sense of foreboding that comes with the realisation that my next prediction is this stand-off will not end well for anyone as the red shirts dig themselves more and more into this. Seriously, I’ve been silent during the protests not because I have nothing to say. Au contraire, a couple of us normally apolitical folks are analyzing our surroundings by the hour. I as it happens have been on the road a lot, as usual, but for personal travel, missing every exciting weekend since the protests started. I don’t feel I’ve missed much. I get enough of an idea in my weekdays. Including an afternoon off when the office was worried that the protesters were going to advance towards us, effectively blocking off traffic. Instead, I offer an earlier snapshot I took before the mess got bloody. 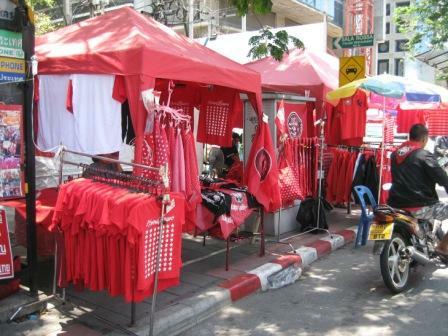 They’ve created their own little society in the corner, selling food, red shirts for potential converts, souvenirs, heart-shaped clappers (valentine overstock that just happened to be the right colour? ), you name it. The gathering was entirely peaceful. Mule-headed but peaceful. I don’t condone the fact that they are likely behind some bomb and grenade attacks and definitely the blood dumping, but it wasn’t the type of behaviour I saw in their sit-down protest. Their biggest overwhelming factor was number, not arms. Which, to me, renders the speculation of a third party instigating the shooting this weekend (yellow-shirters, perhaps?) entirely plausible.